Beat eggs with half and half until light. Pour mixture into shallow pan. Place slices of bread in pan and soak up as much of the egg mixture as possible, turning bread to accomplish this. Rub fry pan with butter, but do not preheat or egg mixture will not cook in the center properly. 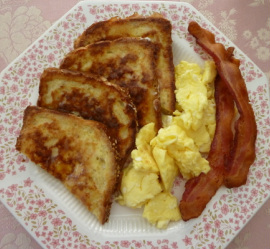 Place bread in fry pan and drizzle any remaining egg batter on the tops of the bread. Cook over medium high heat (approximately 350 degrees) until golden on both sides, flipping once. Variations: Add cinnamon and sugar mixture, orange zest or lemon zest to egg batter. Or other spices. Serve with: Maple Syrup, Apricot Syrup, jams or marmalade. Stuff with: yogurt, cream cheese, fresh fruits. Top with whipped cream. The sky's the limit. Use your imagination for different tasty breakfast concoctions.